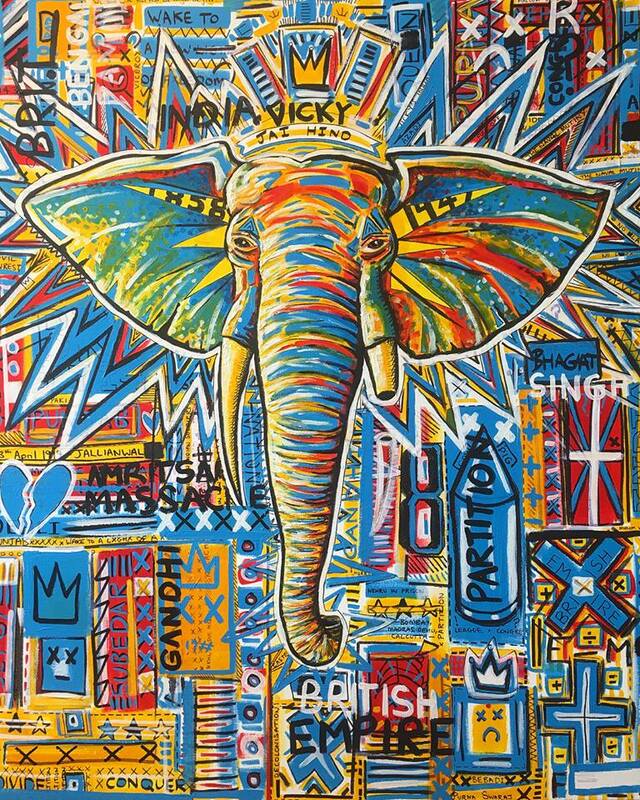 ‘Vicky’ is Queen Victoria, the empress of India, just below a Basquait-style crown. The elephant symbolises India, which is strong and perseveres through decades of colonialism. The broken tusk conveys the impact of colonial occupation on India's economy. Slogans of freedom and statistics of massacres/ famine are hidden around the composition. The background was painted in layers & layers of acrylic paint. This took a lot of time and was crucial to get the colour balance perfect. I wanted to create a ‘busy’ looking image with primary colours covering the entire canvas, divided by black and white. The elephant has additional layers of oil paint using my classic style of pointillism. It took over a week of constantly working away at this painting before it was perfect in terms of colour balance and composition. I tend to paint about dark things with bright colour. The British Raj wasn’t in my lifetime but it wasn’t a thousand years ago either! Only 70 years, a single lifetime, divide us between now and then. I feel uneasy about the growing sense of normality and acceptance of the British Raj. This period of history has always been intriguing to me as a British Asian, with the wounds of empire and partition still affecting our community to this day. The woman in this image is a study from an old record. She is in deep thought, and those thoughts are surrounding her as writing. The record sleeve theme is continued as you see ‘From the original soundtrack’ and ‘side one/two’. 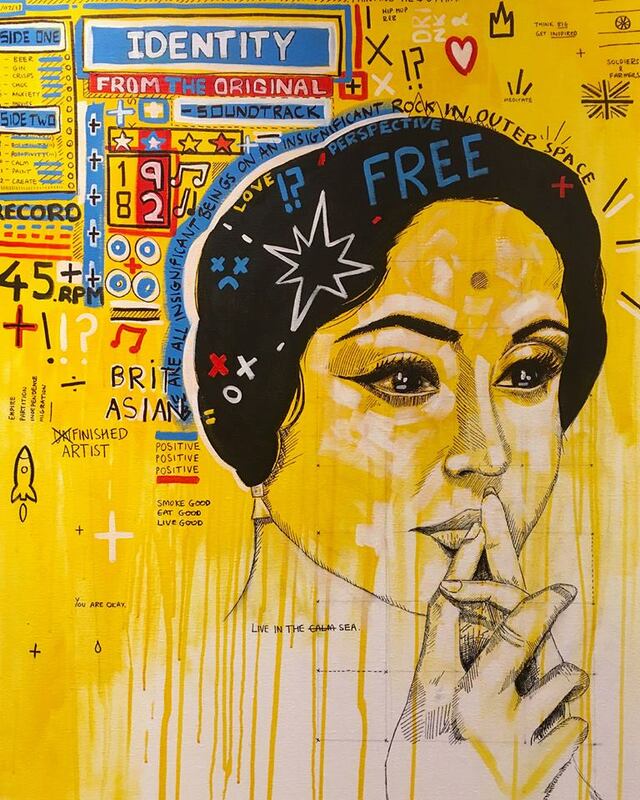 Using pen and acrylic, the study of the woman was done incredibly delicately yet with the striking colour combination of yellow and black, typically used for signs. The eyes were the most important part of the image, they had to be perfect and evoke emotion. The yellow bleeds away into the bottom of the canvas, this was a deliberate tactic to create more white space in the overall image. Using primary colours only, the words and written towards the top of the canvas- this was to make it ‘busier’ as you go up the canvas. This piece is essentially a self-portrait without me in it. Me, nor anyone else probably wants to see my face on a canvas- the mere thought of it makes me cringe. I wanted everything that comes with a self-portrait without actually doing one. I was looking at my late grandmother’s record collection when I saw this pose which I immediately fell in love with. I decided to use her as my muse for this painting. In the writing at the top left, ‘Side one’ is stuff that goes in (both literally and emotionally) and ‘Side two’ is what I try to push out. Among the humorous things that go in like 'beer' and 'crisps', I also added 'anxiety' as have suffered from it for a number of years. I rarely speak out about my history of anxiety - so this painting marks a real shift where I’m letting my personal life and art meet. I also wanted to express my confusion around identity of being a British Asian, which has been a continuous theme in my work, so I made this the title of the record.